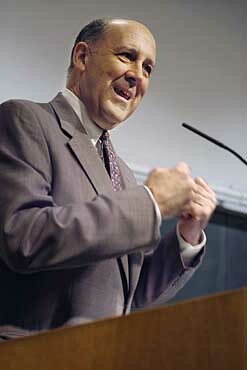 Wisconsin Governor Jim Doyle and his wife served as Peace Corps Volunteers in Tunisia in the 1960's. In the first sign Democratic Gov. Jim Doyle could face trouble on his left flank in next year's gubernatorial election, Madison state Rep. Spencer Black said Thursday he's considering challenging the first- term governor for the Democratic nomination. Black said he was still weighing the decision and stressed he hadn't planned to make any public announcement. But he readily confirmed rumors he might be a candidate. "I have been asked by people concerned about the direction of the state whether I would consider running for governor," Black said. "When asked whether I would dismiss that request out of hand, my answer is no. I'll leave it as an option." He declined to identify the people urging him to run. Black, 55, said he agreed with Doyle's vetoes of several bills the Republican-controlled Legislature has passed since he was elected in 2002. "But I think he has fallen short in a number of areas, especially environmental issues, energy policy, tax policy, university (funding) and (campaign) reform," he said. He particularly objected to Doyle's signing of the so-called Job Creation Act, which made sweeping changes to state air and water pollution laws, and the governor's vow to eliminate 10,000 state jobs. Both have cost Doyle dearly among two of the Democrat's most loyal constituents: environmental groups and labor. Doyle wasn't immediately available for comment, but Lt. Gov. Barbara Lawton said Democrats' primary concern should be reversing the party's slide in the Legislature. "Both (Black) and we would be in a far better position to govern well if we had a whole group of legislators like him," said Lawton, who praised Black for advocating for stronger environmental protection, collective bargaining rights and women's reproductive rights. Black acknowledged any move against his fellow Madison Democrat could hand Republicans a political wedge they could use to regain the governor's office in 2006, a critical factor he said he needs to consider. "I need to ask, 'What is the best way to advance the causes and issues I'm concerned about?' " Black said. "I'm not at all convinced that running for governor is the best way to do that." Elected to the Assembly since 1984, Black was minority leader in 2001 and 2002 but stepped down after Democrats saw their numbers dwindle from 41 to 39 in the 2002 election. Averse to raising cash - he's never faced a serious challenge for re-election and doesn't accept political action committee money - Black said he never felt comfortable shaking the money tree for fellow legislators. That would have to change if he runs for state office. Black reported just $144,000 in campaign cash earlier this year; Doyle raised and spent nearly $6 million in his 2002 election. For now, however, Black said he is focused only on running for re-election to the Assembly.